Straight up or with a twist, neat or on the rocks, shaken or stirred – we have everything you need to make the perfect alcoholic and non-alcoholic cocktails. 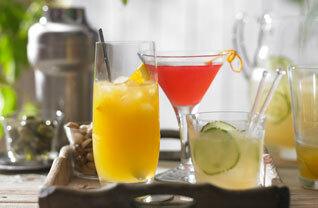 Celebrate in style and show off your mixing techniques with our favourite cocktail recipes. If you want to party with the perfect mojito, relax with a dirty martini, or entertain with a classic champagne bellini, simply follow our essential cocktail making guide for top tips and easy recipes. Mixers: Cola, ginger ale, Indian tonic water, soda and mineral water, fruit juices such as tomato and orange. Spirits: Brandy, cognac, gin, pimms, rum, schnapps, tequila, vodka and whisky are the basis of many cocktail recipes. Always prepare well. Assemble your bottles, have all your dry ingredients to hand, pre-cut your fruit, and ensure you have enough clean glassware. If you are catering for large crowds, try to prepare in bulk. Multiply the ingredients by the number of people you are expecting. The exceptions are drinks containing dairy products, which must be mixed just before serving. Mix the ingredients of punches or mulled wine several hours beforehand. This allows the herbs, spices or fruit to marinade for extra flavour. Remember that no recipe is written in stone. If you think a hot toddy tastes better using bourbon, rather than ordinary whisky, use it - it's your party. Go to town with garnishes. Follow the basic rule that the garnish should reflect something that's in the drink and then be as creative as you like. Sugar syrup can be made very simply. Make your own sugar syrup: gradually pour and stir 2 cups of granulated sugar into a saucepan containing 1 cup hot water and simmer until the sugar has dissolved. Cool, then pour into a clean empty bottle and seal. If kept in the fridge, this mixture will last for a couple of months. When a specific brand of spirit is called for in a recipe, use it - it's probably been chosen for its unique qualities. Remember to have plenty of ice - You can buy bags of ready-made ice cubes from your local Waitrose. Where the recipe tells you to 'shake with ice and strain', place all the ingredients with cubes of ice in a cocktail shaker (fill with two thirds ice) and shake briskly for 20 seconds. Leave the ice behind as you strain the liquid into your glass over fresh ice. 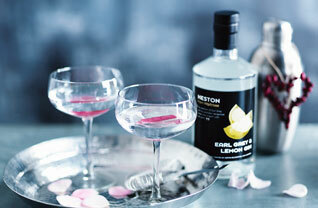 In this handy video Mixologist Andy Pearson shows you how to make a classic Cosmopolitan cocktail. Waitrose spirits buyer, Herchelle Perez Terrado and Emma Ramos from Diffords Guide show you how to make a Poinsettia cocktail - a delicious alternative to a traditional glass of champagne.